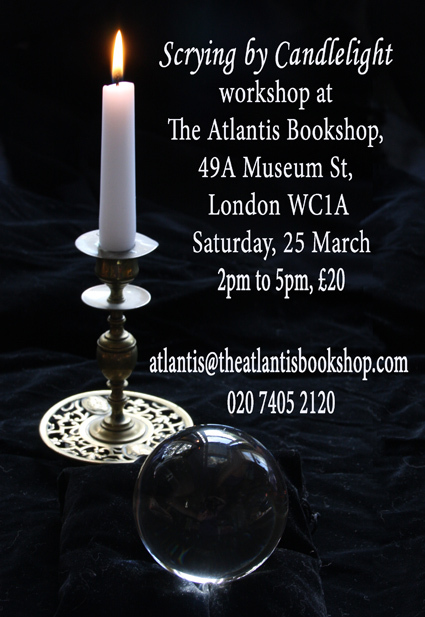 My next Scrying by Candlelight workshop at The Altantis Bookshop in London is on 25 March. The afternoon workshop is in the esoteric bookshop's lovely basement temple. The workshop teaches the techniques of scrying using crystal balls, dark mirrors, candles and water. It is a practical afternoon with lots of opportunity to develop your psychic senses to see the past, the future and the answers to questions in reflective surfaces, flames and smoke. All materials, as well as tea, coffee and biccies, are included.